Back in 2012, I was on Twitter and saw a tweet from Ani Phyo, a chef, stating that people who entered a raw food challenge could win a Vitamix. 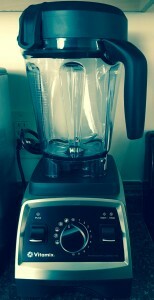 At the time, I was in the market for a Vitamix, so I looked into how I could join this challenge. I clicked the link provided; it rerouted to Facebook. I didn’t (and still don’t) have Facebook, so was unable to enter the challenge…This left me out of the running for the Vitamix. But, I was intrigued by the idea of the raw food challenge, and dug deeper to learn more. I discovered Ani Phyo had recently released a book, Ani’s 15-Day Fat Blast. I ordered it to give the raw food challenge a try, even without the Vitamix incentive. The book begins with some introductory text about the value of raw food and the importance of the foods incorporated into the 15-day plan–coconut oil as antibacterial, cilantro as detoxifying, dates as a healthy sweetener, and so on. The plan is packed with superfoods: some I had heard of and had in the kitchen – maca, matcha, spirulina; others I was introduced to, like nutritional yeast. I got my shopping done and started the plan. The first 3 days are no chewing—smoothies and cold soups only. Days 4 through 7 are largely smoothies and soups, but they also incorporate some fruit and salads. Finally, days 8 through 15 are smoothies for breakfast and then chewable foods (and desserts!) for the rest of the day. All in all, I was full and satisfied the entire 15 days. The plan included foods like sushi, peach crumble, fudge brownies, and zucchini with marinara sauce – all raw, these items were all you can eat and amazing! On day 15, I weighed in and lost 8 pounds. I also saw differences in my skin – it was clearing up and became soft and smooth. Talk about nourishing your body from the inside out! I found my first day off of the plan, I was still eating raw food. This brings me to why this 15-day challenge was important to me— and it had nothing to do with the weight loss. Without losing any weight at all, this challenge was worth is because I re-learned how to eat. Generally, I skip breakfast—and now I give myself the 5 minutes in the morning to throw fruits and greens into the blender, or even prep at night so all I have to do is blend in the morning. While I learned a lot about food and my own diet, I also found that by eating differently, I was acting differently. Consuming healthy, raw, first-generation foods gave me more energy and made me want to treat myself better. My apartment was cleaner. I rode my bike more in lieu of driving. I had a healthy glow that was reflected in all areas of my life. This improvement to my diet created improvements in other dimensions of my wellness. Fast forward to 2015, and I just did 11 days of the challenge a couple of weeks ago. It’s become a habit over the years to do anywhere from 3 to all 15 days of this cleanse a couple of times each year. And, with good reason—A recent study illustrated that just 5 days of a diet that’s low in protein, low in carbohydrates, and high in healthy fats each month has amazing health benefits. The food we eat has such an enormous impact on our wellness, including how we feel in the moment and contributing to risk factors for our futures. Being mindful of what we consume is crucial. I’m not proselytizing a raw food diet. Coworkers at PRA have seen me eat a cupcake on more than one occasion. I am suggesting that we, at least occasionally, take some time to be a little more mindful about the food we’re eating. How does it serve us and our bodies? Are we getting the nutrients our bodies need? How do we feel during and after consumption? Are we eating because we’re hungry, or are we dehydrated, or perhaps using food as a form of support? When we consider physical wellness, which includes nutrition, sleep, activity, and disease prevention/management, what we eat plays a huge role. Not only what we eat, but how we eat. Are we eating while driving or watching TV? Did we eat an entire meal while talking on the phone and then hang up wondering why the plate is empty? Bringing a level of mindfulness to what and how we eat is a great way to foster wellness in this area. For me, the occasional detoxifying cleanse is a great way to reset and refocus on whole and healthy foods. How could resetting and refocusing look for you? UPDATE! I finally purchased a Vitamix — I set it up in my kitchen yesterday and am excited to start 2016 with some new recipes!